Being a landlord doesn’t only mean collecting rent and holding rooftop parties for your tenants. It also entails responsibilities especially when it comes to tenant and property safety. Adhering to these guidelines ensures that no lives are lost and real estate is kept fresh and new at all times. Landlords are duly required by law to keep their tenants safe. This responsibility extends throughout all ranges of accommodations that are covered by leases or licenses. It also includes any residential property provided for rent, holiday accommodations, rooms, private households and hotels. The Gas Safety (Installation and Use) Regulations 1998 tackles several key items that will help guide landlords on how to comply with the act. It also aids tenants as they are made aware of the landlord’s duties with regards to gas safety. The act deals with the installation, maintenance and utilization of gas appliances and fittings in both domestic and commercial properties. It covers compliance on gas safety laws as well as guidance on the landlord’s part. The landlord has 3 main responsibilities if he chooses to utilize gas in the premises. First, he will be responsible for all the maintenance of the facilities and pipework. This also includes having all applicable gas appliances serviced as defined by the manufacturer. If there is no advice as to the frequency from the manufacturer, a Gas Safe registered engineer should be able to provide inputs. If none was solicited, service should be done annually. Second, it is also their responsibility to have safety checks run on all appliance and flue every 12 months. This annual check is essential in ensuring that all the appliances and fittings are safe for daily use. Lastly, it is also the landlord’s responsibility to provide copies of the gas safety record to existing tenants within 28 days of this being completed. For new tenants, they should be provided copies of it prior to moving in. For their part, landlords should keep their copies for a rolling two year window. All checks must be performed by a registered Gas Safe engineer. 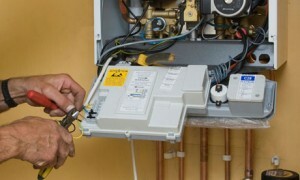 Tenants bringing their own gas appliance are held responsible for it. Landlord responsibility stops at the gas pipework. Tenants should be made aware where the main gas valve is so as to prepare for emergencies. Tenant leases or contracts should explicitly allow landlords access for safety inspection and maintenance of the gas pipework. Landlords should document well the events and actions taken in case any tenants refuse access. Tenants that are on short-leases are still subject to gas safety inspections and maintenance if their lease period falls on designated time. Central heating systems are composed of boilers, pipes, radiators and the thermostat controls. While this structure worked out for several decades, people have begun seeing problems especially around winter. Switching on the boiler during the cold season can sometimes be a problem. Likewise, radiators also get discolored and even worse, your pipes get infected by black sludge that can become too thick to even see through. This sludge is simply a formation of rust that has accumulated from radiators and other end-user devices. When all these fall down to your central heating system, you’ll find that it’ll grow inefficient. A good analogy would be the effect of fatty foods on your heart. The more it accumulates, the more dangerous it is for you. While there are ways we can cure this, the old saying, “prevention is better than cure,” is also applicable to central heating systems. With an inhibitor in place, rust will not form inside the central system anymore. 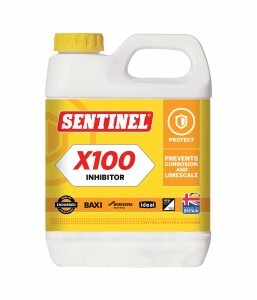 Inhibitors coat the metal and prevent it from chemically reacting with other substances. When sludge has already formed, it can be tough to remove. As the sludge is a combination of various metal oxides, it is inherently magnetic. Despite people knowing this for several years, there were numerous different approaches to the problem that involved complex solutions and compounds. 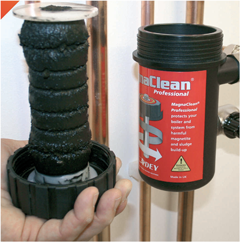 Recently, Adey Ltd solved this with a simple approach which they coined Magnaclean. This ingenious device simply sits inside your central heating system and does all the work for you. It utilizes a magnet to clear the water running through it by attracting all the metal oxides. As soon as it is full, you simply pull it out, wash it and return it to its position. 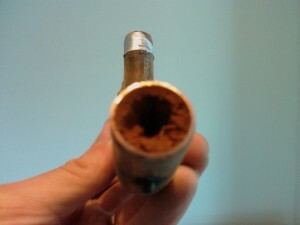 Magnaclean doesn’t prevent rust 100%. However, it does minimize any damage caused by rust. That’s why it can be used in conjunction with an inhibitor too. Some critiques say that all you need is an inhibitor and don’t need any Magnaclean. While their functions do coincide, it would actually be better to have both in place. Why? Well, how do you know you have placed sufficient inhibitor? Magnaclean could be a way to ensure that you are protected on two fronts. Magnaclean helps you in numerous ways. Maintenance of the central heating system is minimized as it works independently and only needs to be cleaned when it is full of metal oxide. This results to a more efficient central heating system which, in turn, results to savings on resources. Additionally, carbon emissions are also drastically reduced when Magnaclean is put in place. Carbon monoxide detectors are known to save lives. Highly regarded as the best home security investment one will make, carbon monoxide detectors have a different function than smoke or heat detectors. They detect the presence of carbon monoxide in the household and will trigger an alarm if it is at dangerous levels. Why is this helpful? It’s because CO is practically undetectable. The gas is tasteless, odourless and invisible. As such, you can never tell when you are already being suffocated by this lethal gas. Carbon Monoxide is a gas produced by improperly burned fuel. These can be commonly seen in running cars, gas ranges, furnaces, gas powered heaters, charcoal grills and wood-burning fireplaces. If any of these devices or facilities perform an incomplete combustion and is located in an area with poor ventilation, carbon monoxide can accumulate and reach lethal levels. By installing a CO detector, you can be alerted to rising levels of this vile, invisible gas. Three basic types of CO detectors exist in the market. These are namely electrochemical, semiconductor and biomimetic. This type of detector checks for the presence of CO in the air by tracking the internal electrical current of the surroundings. When slight changes in these currents are caused by the presence of carbon monoxide, the alarm will sound. Electrochemical detectors utilize sensor electrodes coupled with a chemical solution to detect such changes. Due to their adeptness at detecting lethal levels of CO and lengthy battery lifespan of at least 5 years, electrochemical detectors have gained a great reputation and are highly recommended. Semiconductor detectors were the first to be invented among the 3. They work similarly to electrochemical detectors in the sense that they monitor electric current changes. However, they don’t utilize chemical solutions like the former. Instead, it has a semiconductor that is typically made of tin dioxide. This semiconductor suffers a lower resistance brought about by electrical current change whenever it comes into contact with carbon monoxide. Whenever an increase is detected, the alarm is triggered instantly. Although it is pretty outdated, it is still considered a great choice as it doesn’t require any maintenance. These type of CO detectors are internally fitted with a gel pack containing synthetic haemoglobin. The gel pack has the capability to absorb carbon monoxide. When it does so, the haemoglobin reacts by changing colour. Sensors are readily available to react to any change in colour of the haemoglobin. Once detected, the alarm is sounded right away. Although it sounds pretty high tech, there have been incidents of false alarms caused by biomimetic detectors. This is because contaminants can accumulate in the gel pack thus triggering the sensor. For best results, the gel pack of these detectors should be replaced every 2-3 years. Biomimetic detectors utilize batteries and are known to last up to 10 years. We recommend installing a audible carbon monoxide alarm and our choice would be from Honeywell. Where are these detectors installed? It has become a common practice for households to have one carbon monoxide detector per floor. This also includes the basement and the attic. 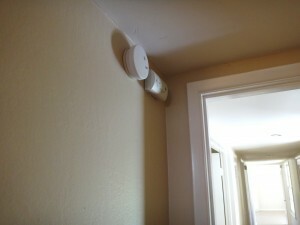 These detectors should be installed around 10 feet away from bedrooms so that they can be heard from easily. Likewise, it is also advised to have these placed near any devices that burn fuel such as heaters and furnaces. As a general rule, it is also wise to contact your local energy department and also your gas provider prior to installing any CO detector. Also, be sure to always heed the installation guide and troubleshooting tips provided by the manufacturer. What power source to select? CO detectors can be powered in various ways. These are namely via battery, 12v/24v and 120v power sources. Batteries are rather convenient as they allow you to use your device without any cords protruding from it. However, when the batteries on these detectors run low, they do beep annoyingly until these are replaced. For homes that have grown accustomed to serene surroundings, this may not bode well for the residents. As batteries need to be replaced on a yearly basis, it is prone to being forgotten. In fact, some people remove the batteries altogether especially when they don’t have replacements on hand and the beeping noise gets annoying. When this happens, the household then becomes at risk of being overcome by CO gas due to the lack of a round-the-clock detector. This type of connector refers to that in typical household security panels. These are usually regarded as the best choice as security systems that monitor your household also have the capability to monitor your monitoring devices. With this in place, you can easily tell if one of your detectors has malfunctioned. Likewise, security systems also have the dial out functionality. This means that if there is any security breach, the proper authorities are contacted right away. This functionality can also be extended to your CO detectors if needed. As soon as dangerous levels are detected, you can opt to have local authorities informed of the situation as well. This type of power source is the most common among households. They are better than batteries in most ways. Although they do lose monitoring capabilities when the power is out, they do come with backup batteries for such events. Also, unlike battery operated detectors, they will not suffer a degradation of performance whenever the source runs low. Plus, they won’t spam you with incessant beeping until you replace the internal battery. If you were around Oldham in Greater Manchester last June 26, 2012, you probably heard of the 2012 Oldham explosion. Even if you weren’t, I’m sure you’ve heard of the news or saw the Wikipedia article on it. It was a pretty devastating incident that caused the death of a 2-year old kid and caused over a million pounds worth of damage. The cause of this event was a gas leak and the perpetrator was a then 27 year old man who has since been charged with manslaughter. It seems horrific but such tragic events can ensue if we fail to report or detect gas leaks. Even the slightest hint should set off an instant alarm and action should be taken at once. Here are some tips to keep in mind for such an occasion. Refrain from using naked flames or smoking near gas leaks. Even the tiniest of sparks is enough to cause an explosion. Be sure you inform your neighbours and other people in the immediate area. They are directly affected and should be made aware of such hazards. Call the National Grid Emergency Service at 0800 111 999 and you will be directed to their call centre. They are open round the clock and can immediately assist you. Just be sure you are ready with pertinent information such as your address or the location of the suspected leak, how many people are potentially at risk, how long you’ve noticed the smell as well as your name and contact number. Having these at hand will make your conversation with them all the more quicker which can result in faster action. When you’re ready to evacuate, open all the doors and windows. This will allow the gas to leave the affected area thus minimizing the damage caused by a subsequent explosion. 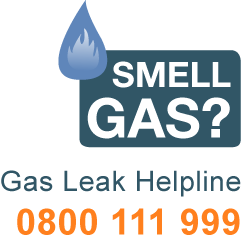 Contact your gas supplier and inform them about the leak. They’ll be able to turn off the supply from their end and also give you advice on how to proceed. Switch off the device or appliance that you suspect is causing the leak. Avoid using it until it has been deemed safe by a registered engineer. Double check the head count to ensure everyone has vacated the premises. Not everyone may have been able to smell the gas and sense the danger. Turn off the gas at the main switch. It should stop any further leaks. In the event that you or someone close by feels faint or ill, seek medical assistance right away. 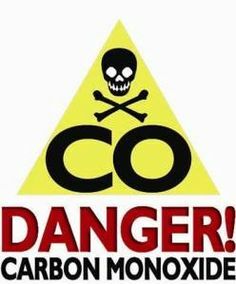 Carbon monoxide poisoning is dangerous and can cause minor damage if remedied as soon as possible. We hope you take all these tips seriously. They work for premises of all sizes. As long as you keep these in mind, gas leaks won’t escalate to fatal accidents. Being in the cold for prolonged periods of time can be detrimental to one’s health. For households that are visited by the cold weather regularly, having a boiler around helps a lot. However, you should always be sure that the boiler isn’t showing any signs of breaking down. This is easily done by regularly maintaining it and calling specialists whenever minor problems ensue. By doing so, you ensure the boiler’s longevity and also spare yourself hefty expenses in the long run. A boiler bogging down on you in the middle of the night is the last thing you want to happen. Not only will it ruin the environment for your family, it will also cost tons to get it repaired. Worse, if it is cold season and you can’t afford to wait for repairs, you might end up buying an entirely new one. Here are some of the telltale signs that your boiler needs attention. Weird smells brought about by heater usage should be brought to the attention of professionals right away. Gas leaks instantly come to mind and that is a very serious problem to deal with. Leaving this unchecked is not advised as you can get engulfed in carbon monoxide rather quickly. As nobody can see, smell or feel CO, you should get tests done or install detectors in your home. Prolonged exposure to the gas can result in numerous complications and can even be fatal. This would mean that the boiler is not anymore as efficient as it should be. Because it can’t reach its full potential or it takes longer to do so, this will result in higher energy costs. Problems such as this usually warrant immediate replacement. If you are hesitant to do so, you can hire a professional to take a look at it as well. They will be able to advise you on the remaining lifespan of your boiler and whether it is better to have it repaired or replaced. As with any device that has mechanical parts, they should not have any weird noises. Otherwise, it is safe to assume something is amiss. Be sure you are aware of your heater’s regular sound. That way, you’d know if something was off when it sounds differently. Hissing sounds would mean that there are iron deposits or sludge lodged inside. These would cause an uneven distribution of water that can cause the boiler to overheat or shutdown. On the other hand, a change in the furnace’s sounds would indicate a problem with certain internal components. Puddles of water would obviously mean a leak in the machine. 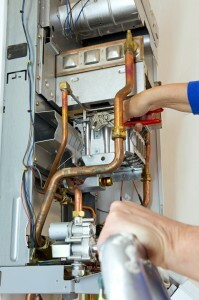 Leaks make it harder for the boiler to continuously offer heat as there are losses along the way. A repairman should be called right away to alleviate the problem and save on energy costs as well as to prevent further damage to the boiler. Homeowners always wish they could invest more space for their bathrooms. Bathrooms are very important and are used just as often as the kitchen. Why is it that only the kitchen is spacious though? Bathrooms are where we relax after a long day at work or school. We aim to unwind and pass the time there but the small dimensions can be very dissuading especially if there is clutter all around. It is unfortunately the nature of homes for bathrooms to be small. That’s why it is important to plan the bathroom carefully so you can enjoy it to the fullest. Here are some steps on how to accomplish this. Using glossy tiles on the walls and the floor can give the illusion of more space. 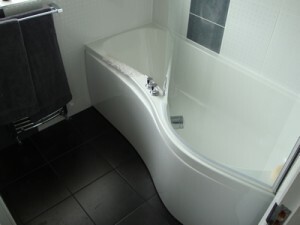 Likewise, using a glass enclosure to separate the shower can also achieve the same effect. When both are in place, you’d be surprised how spacious the room looks. Additionally, adding a mirror in strategic places will also do the same. Not only does it help spread out the light but it also adds more space and depth to the bathroom. Using bigger tiles is a simple and effective way to declutter the floor. With small tiles, you have more edges and corners that are noticeable. This can end up being hard on the eyes. Big tiles, on the other hand, have lesser endpoints and look smoother because they cover a larger area. This makes the floor look like a large fluid space as opposed to broken down parts which is exactly what small tiles achieve. It is important to have a clear mindset when fitting the room with fixtures. 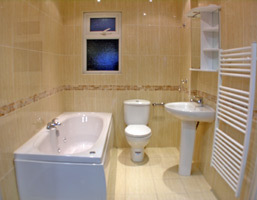 You shouldn’t be dismayed at having a small bathroom and not having enough space for the fixtures you had in mind. Instead, you should only purchase fixtures that will suit the bathroom you have. Most of the bathroom fixtures we consider almost always have compact versions. Vanity units, cabinets, shelves and the like all have smaller versions which you can use for smaller bathrooms. Also, you can save more space by using wall hung fixtures like toilets and sinks. These have the mechanisms to be installed without bases and as such, require less space and fit into corners nicely. Cabinets, shelves and other storage spaces should be maximized to minimize clutter on the outside. Clutter can make the bathroom look smaller than it actually is. If you need additional storage, overhead racks and shelves can also help. Taking advantage of natural light is a very cost-effective and also space-saving tip. Using light colors for the walls help make it utilize natural light efficiently. White is the ideal color to go with but other soft colors like latte, magnolia, caramel or mint green would also do nicely. Additionally, color schemes and patterns should also complement one another. They shouldn’t be too excessive otherwise the room can get too confusing. Mismatched patterns and fussy furniture will also contribute to visual clutter.